One of the trends in the early days of Cubism, Orphism was a style of painting that evolved in Paris during the period between 1911 and 1914. The orphists rejected the rigid principles of a non-abstract art and returned to “pure color” with the purpose of communicating their intense enjoyment. They were imbued with the new spirit and fascinated by the technological progress of the modern world. Robert Delaunay’s Homage to Blériot was painted in a state of extreme spiritual happiness, reflecting the whole atmosphere of the times. It is a testimony to the skills of the airplane constructors – the new heroes of a modern epic fantasy. World War I, however, spelled the end of the enthusiasm and optimism of the machine age. Looking from our vantage point today, it is not difficult to see that Robert Delaunay’s painting Homage to Blériot (Fig. 1) marked the end of Orphism or Orphic Cubism.1 Furthermore, Blériot appears to have marked a significant watershed in its own right, signifying not the beginning, but rather the culmination of an exceptional epoch in the European past. This work summarizes the experience of its author and the orphists in their quest for a sublime poetics of modernity, bearing testimony to the new spirit as a product of its era and a visual expression of the exaltation of the modern age. Such a powerful and omnipresent emotion was crucial to the creative endeavor of that revolutionary period. With that in mind, let us turn to the time between the first group exhibition of the Cubists, held in 1911, and the Salon des Indépendants of 1914, when Homage to Blériot was exhibited. The aesthetics based on Cézannesque formulas and the principle of the multiplication of perspectives as well as the reduction of forms to simple geometric shapes, and, on the whole, based on a new perception of reality reached its apex during the so-called analytical phase of Cubism. The rupture with the principles of mimesis took on a dramatic form; the process of the destruction of form brought the painting on the verge of abstraction, and the 'heroic' walk on the very edge of representation would continue through the next, “classical” Cubist period, also called “hermetic”. The broken and scattered fragments or 'facets', as abstract entities, could only be reconstructed by certain characteristic details. A row of buttons, a moustache, the strings and sound hole of a guitar, or some stenciled letters later on ̶ words associating the bohemian atmosphere of bars, bistros, and nightclubs ̶ would become visual 'keys', always capable of bringing the painting back to the safety of the representational world. Neither Picasso nor Braque participated at the first public showing of Cubism, which took place in Salle 41 (Room 41) at the 1911 Indépendants, so that the highly dynamic development of the analytical breaking down of form and space were known only to the closest associates of the first Cubists;2 Robert Delaunay and Fernand Léger were certainly among the most progressive of their followers who took part. They understood the language of Cubism very well but each of them, having achieved the basic objective, sought out his own idiom by experimenting with form, space, and color. Using the teachings of the chief protagonists as foundations on which to build their individual styles, both artists showed decisiveness and ingenuity in rejecting some crucial principles of the then rapidly evolving aesthetics. First and foremost, the suppression of color and volume was unacceptable. What is more, they decidedly left the smoky milieu of bistros, bars and nightclubs for something more precious to them: they ventured out into the streets, but not in order to catch the glimpses of the urban landscape the way the Impressionists or the Fauvists did. Instead, they wanted to celebrate the lively and fervent metropolis as a stage of technological revolution, from which they could speak out loudly and freely. Moreover, they were willing to participate wholeheartedly in the creation of history. The dialects of Cubism eventually developed into new poetics. In his Tubism, Léger builds an imaginary futuristic world of mechanics and robotics ̶ the world of cylindrical shimmering metallic forms, machinelike elements, joints and structures reminiscent of industrial-organic shapes. In trying to find his own way out of Cubism, Delaunay displayed a somewhat more poetic approach to modern issues, striving to produce works that reveal passionate enthusiasm of a convert who had just been initiated, with an equally passionate desire to awake faith in the future in his fellow contemporaries. An Orphic painting abounds with motifs, fragments, constructions, and machinery, along with pure forms as metaphors, signs, and symbols of the modern world. Using Picasso’s “free and mobile perspective” in his Eiffel Tower (1911),3 Delaunay managed to resolve plastically the problem of the complex construction that was hitherto intractable by traditional methods; he incorporated those “seven hundred feet of girders and beams, those four arches spanning three hundred feet” within the framework of his painting, as Blaise Cendrars noted in 1931.4 However, apart from the visible efforts to present multiple aspects of one object simultaneously, one cannot fail to perceive in this work the contours of a whole new aesthetic. The color scheme was far from typical of the Cubism of the time; quite the contrary, the works of the “analytical” phase were painted almost monochromatically. Besides, Delaunay’s iconography was not a Cubist one. Like Léger, he seemed to be more preoccupied with the outward forms of modern civilization, those technological masterpieces which were soon to become symbols of the new age. The work of modern architecture and sculpture at the same time, which would put in the shade all the existing edifices of cultural and historical significance, thus spoiling the “untouched beauty of Paris”, as the fierce critics of it had maintained,5 inspired avant-gardists with enthusiasm and admiration. As the colossus was being built, a new aesthetics of built steel began to appear, attracting considerable interest of contemporary artists. They glorified the art of the engineer who seemed to have taken particular pleasure in exposing the intricacies of his construction. A thousand feet of open form, made of metal pieces held together by rivets, suggesting accuracy and precision, heralded a new era in materials, design and construction methods, but also revealed its poetic qualities for the rhythm of the intertwined girders of that 'temporary' installation evoked a new sentiment of modernism. It looks as if such a futuristic concept of light and airy mechanical structure could well be incorporated into an airframe design of some kind. In that glorious age of record breaking, the Eiffel Tower was to become the new Pharos ̶ wonder of the modern world and the symbol of the City of Light. A lighthouse in the sea of history, this work resembling a launching ramp of some kind, was more than suggestive of what would be achieved in the foreseeable future; in somewhat less than eighty years from the dedication of the Eiffel Tower in Paris, man would land on the Moon. In order to express modernity so deeply felt, Delaunay and Léger reintroduced color into what was still essentially the structure of Cubism. By using the method of contrasting colors and volumes, they sought to generate movement in their paintings, in opposition to the somewhat static character of Cubism. Indeed, with these devices they achieved extraordinary vigor, adding to the painting’s dynamic qualities. The emphasis was yet again placed on poetic content in art, and a painting was expected to exceed the boundaries of perception and the fundamental meaning, while simultaneously suggesting multiple emotions. Seen in this way, the cubist concept of multiple perspectives was further developed. Delaunay considered color a structural and expressive element. Therefore, the writings of Eugène Chevreul (1786-1889), Hermann Helmholtz (1821-1894), Ogden Rood (1831-1902), and Paul Signac (1863-1935) played an important part in his art. The phenomena they observed were based on verifiable scientific principles. Laboratory experiments had already proven to be far more superior to the other methodologies that could be used to establish theoretical propositions. By lending an aura of scientific legitimacy to the creative process, the intellectual triumph opened new horizons giving the artists a greater sense of achievement and self-confidence. While his work conjoined art and science, Delaunay, like many of his contemporaries, had a vision of his own. It was well based on his own experiences and intuition: “I have dared an architecture of color […] in the hope of creating a dynamic poetry which remains wholly in the realm of visual means, without any kind of literary associations and descriptive anecdotes”.6 The beginnings of that color-dynamism had already been heralded by Delaunay in a series of studies of the Eiffel Tower, and the concepts of geometric structures and Simultaneism were further developed in his later series of paintings entitled The Windows, created between 1911 and 1913. Around the same time, he presented his Simultaneous Windows and Simultaneous Disks series, wherein he promoted his formula of “simultaneous contrast”. Those paintings were based on Cézannesque principles of contrast and harmony of colors, but Delaunay explored the concept further, especially as influenced by Chevreul’s theory of simultaneous contrasts of color. Delaunay pointed out parallels between color and music: “I played with colors as one would express himself in music by a fugue of colored, varied phrases”.7 In a letter to Wassily Kandinsky in 1912, he wrote about his studies in the transparency of color, whose similarity to musical notes had driven him to discover “the movement of color”.8 That dynamism of colors, similar to musical notes, led to kinetic sensation or the experience of motion through time and space. Exploring these effects produced by modern technologies, he dispensed with the object, and all what was left was pure speed, the Futurist ideal of aesthetic excellence. In his paintings of that period, there were no more orientation parameters, no reference points, roofs, buildings such as the Eiffel Tower, no quantifiable characteristics of the physical, natural world whatsoever. In his eagerness to represent sheer motion, he had to avoid any substantial elements. Non-material speed was all that mattered. In his painting of 1912 entitled Simultaneous Disk, he continues to navigate through the masses of color with no measurable data. The interaction of colors is so intense that it seems as though the configuration of circle with concentric rings is moved by itself. Delaunay’s Simultaneism represents an open system of associations, in which the whole range of ideas about movement would allow us to perceive the painting as expressive of motion, the motion being an essential precondition for the existence of matter in time and space—from the structure of the atom to the movement of planets around the Sun. Artistically and poetically, Simultaneous Disk seem to have captured the revolutionary spirit of the time, bringing about the cognition of the concept of micro and macro universe, with no boundary between them. It is intriguing to speculate how much Delaunay knew about physics at that time; however, it goes without saying that he very well understood the historical significance of his times, the atmosphere of change and development of science and technology in modern society. The Rutherford atomic model, or planetary model of the atom, was proposed in 1911, Bohr’s model was introduced in 1913, and it might almost seem as if Delaunay wanted to leave some space for future discoveries to be conveyed or interpreted through that fantastic structure of infinity. Solar disks and simultaneous dynamism predominate in his Sun, Tower, Airplane (Fig. 2). The painting is literally filled with light decomposed into variously colored rays due to refraction and dispersion. Circular forms, positive energy of light and color, along with the symbols of modern age or technological progress, joined together in a sublime, spiritual constellation. A sumptuous coloristic fantasy of swirling masses seems to suggest the idea of the lift force which sustains the airplane in flight as well as the burst of creative energy without which there would be no science, no arts, and no life. Artists such as Delaunay and Léger were convinced that beautiful poetic content was deeply embedded in remarkable modern forms, such as the Eiffel Tower, the airplane, the automobile, and other innovations tending to remind us of something great.13 As an urban landmark of an unprecedented scale, the Eiffel Tower soon became the prototypical image of growth and rapid development, serving as a beacon for modern art and design. Moreover, this marker of a unique identity reminds us of yet another beginning; it was constructed in 1889 at the entrance to the Champ de Mars on the occasion of the Exposition Universelle held in Paris during the year of the 100th anniversary of the fall of the Bastille. Twenty years after the ceremonial opening, precisely in the year of Blériot’s historic flight, a radiotelegraph was set up on the Eiffel Tower, and so this iconic edifice was made to figure as another symbol of the exploitation of the ether. Apart from opening up a whole new dimension of communication, those events also provided a variety of inspiration to draw from. 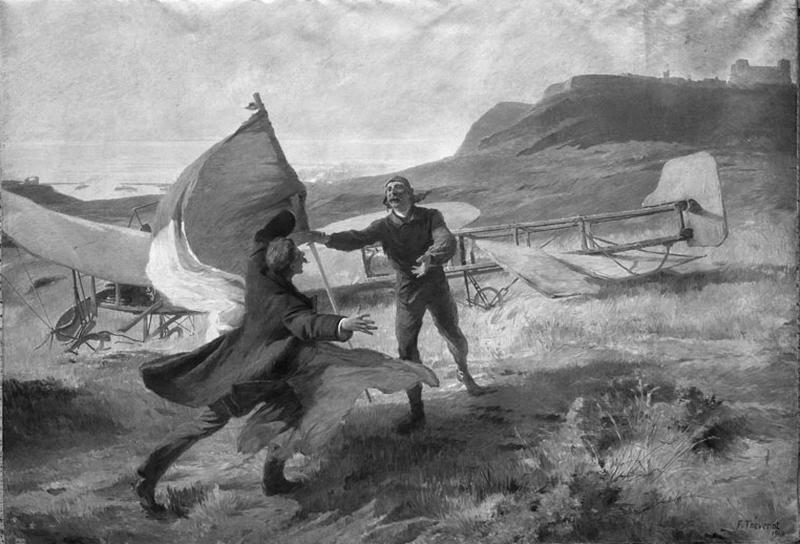 With Homage to Blériot (Fig. 1), Delaunay painted a subject taken directly from contemporary life. However, he reduced the subject matter to simple multicolored shapes, with aeronautical symbols or modernist motifs; his Homage to Blériot was based on contemporary history. We may even suppose that the author chose the particular moment when theBlériot XI, “bearing the weight of humanity, of thousands of years of endeavour”, was triumphantly carried through the streets of early twentieth-century Paris when it was taken to the Conservatoire National des Arts et Métiers.14 However, in treating a historical piece, Delaunay went further and gave a new formulation of a contemporary theme in painting. He created a magnificent vision of modern life in a work which eloquently reproduces the cultural and historical context in which he was moving. After Blériot’s crossing of the Channel, more and more enthusiasts enjoyed the thrill of seeing “those magnificent men in their flying machines”.15 In August 1909, the great aviation meet was held near Reims, France. The Grande Semaine d’Aviation de la Champagne was the first great international air exhibition in which almost all of the important names in aviation at the time took part. The Voisin brothers, Henri Farman, Luis Blériot, and Hubert Latham, to name but a few, competed for altitude, distance, and speed records, in front of an audience of 500,000 people. A few years later, Roland Garros was the first to fly across the Mediterranean, covering a distance of 470 miles in less than eight hours. The French, in particular, showed intense enjoyment in celebrating their heroes’ achievements, and the airplane, as well as the Eiffel Tower, was given a significant place in the collective memory. Soon, it became the new icon of the modern age, glorified in the paintings and poems of the fervent adherents of the machine cult. They belonged to the first generation privileged to see the dream come true, actually taking part in the adventure. The various versions of the painting, executed in different techniques, and the study of its composition demonstrate how the artist sought to achieve the effects greatly surpassing those of documentary paintings which were often commissioned by state officials as records of important events. For instance, looking at Landing of Louis Blériot at Dover, July 25, 1909, painted by François Thévenot,16 we could hardly think of the thrill and excitement of the daring young men breaking barriers and challenging themselves and others to aspire to greatness. With this new approach to reality, created by marrying colors to geometric forms, multiple perspectives to the images of whirling hypnotic disks, all interwoven with symbols, we are invited to drift away, back to those days when the heights of mountains, the vastness of the ocean suddenly ceased to matter. With the Earth’s gravity overpowered by the force of the airplane engine, nothing seems to have stood in our way to success. The gateway to the stars was open, and it seemed as if the universe was waiting for our next move, well, a smart move. Imbued with the spirit of modern times and new ideals, Delaunay wrote: “Constructive mobility of the solar spectrum: dawn, fire, evolution of airplanes. Everything is round, the Sun, the Earth, the horizon, the fullness of life, of poetry that cannot be verbalized—life á la Rimbaud.”17 These words seemingly summarize all his reflections on the subjects of light, color, movement, simultaneity, and dynamism in modern painting. The evolution of airplanes, to which he points, began with the pioneer projects such as Bleriot’s box-kite glider, or those of Gabriel Voisin and other constructors; the emblematic images of the planes or gliders flying over Paris, which although look like the famous aircraft of those days, actually appear as somewhat heraldic in character. Serving a rather symbolic purpose in Delaunay’s painting, they suggest the idea of a sudden soaring success, as if defying those who might see the allusion here to Phaeton’s flight. The airplane epitomized the development of modernity. Narrating the history of heavier-than-air craft crowned with the magnificent Blériot XI, these images illustrate the questioning of traditional values, the glorification of individualism, freedom as well as the faith in intellectual and every other kind of progress. The epoch of a new Renaissance was ushered in by a proliferation of the culture of science, with technology being expressive of cultural values.18 The 'art of engineering' has brought a whole new kind of realism, in which the beauty of a flying machine arises from its function. That new beauty, like the beauty of a “racing car whose hood is adorned with great pipes”,19 emanates from the beauty of speed itself. It was speed, in the first place, that lifted the aircraft off the ground, adding a new dimension to our life. Due to high speeds, the airplane brought about the most dramatic change in spatio-temporal relations, with aerodynamics dictating the ideal design of the craft that was to become a typical symbol of modern times. Delaunay’s sun disks and rhythms express the universal idea of movement. As in the eponymous series, the disks create movement implicit in the rhythm of their colors, instead of expressing it through repetitive kinetic sensations—as in futurist paintings; in a dynamic and chromatic vision of the universe, they could represent celestial bodies, as well as a homage to speed itself, an allusion to a fast rotating propeller, with the unique motion blur color effect.22 This triumphal adventus of the airplane and its constructor into the modern era was conceived not as a moment in time, but rather as the process in which the observer, too, would take an active part in the creation of a history that continues to the present day. Being an active participant rather than a detached historian, Delaunay offers more than just another imaginative recreation of contemporary experience; therein lies his authenticity. A similar interest can be observed in the works of his contemporary Henri Rousseau (1844-1910), like the View of the Bridge at Sèvres and the Hills at Clamart, St-Cloud, and Bellevue, for example (Fig. 3). In his treatment of the subject of contemporary life, we can discern fascination, optimism, and delight, but expressed in a different fashion, a different vision of modernity. The images of the dirigible Lebaudy Patrie, a biplane, and a hot-air balloon are depicted with precision as flying, or rather hovering, in mid-air. The painting is executed in a style that heralds the advent of surrealism. Nothing seems to disturb the harmony of proportions and balance (with the imaginary vertical axis from the balloon to the boat, and the arrangement of the flying objects mirroring the line of the hills below), the primary objective being the symbolic aspect of the composition. The historical significance of the objects represented is alluded to by the accuracy of depiction alone, without the revolutionary zest of the era and without the energy and joy of Delaunay’s or Léger’s innovations. The two artists whose unadulterated desire was to produce a live image of their world in motion, shared still another common interest. In 1912 Delaunay began working on a cycle of paintings inspired by the rugby match between Cardiff and Paris; in fact, during the following decade until 1922, he completed several versions of L'équipe de Cardiff (The Cardiff Team, Fig. 4) depicting the players in the heat of the game combined with La Grande Roue de Paris—the famous Ferris wheel—as well as two recurrent themes in his art, namely the Eiffel Tower as the archetypal image of modernity and an airplane. In order to depict all aspects of the dynamism of contemporary life, within his exuberant style he incorporates the organic motion, sport, and play. The unrestrained youthful energy, keen interest, spiritual and physical strength as well as the intense desire to compete and win as the spiritus movens of the modern epoch, the large Ferris wheel like a mechanical equivalent of the simultaneous circle, closely associated with energy, the idea of the inevitability of progress, a distant allusion to the wheel of history, all merge in Delaunay’s poetic vision of contemporary life. Appearing again, in the upper register of the composition, there is a silhouette-like image of an airplane as a potent symbol of the desire to cross boundaries, to attain ever greater heights and distances; an Astra poster advertises the famous aircraft construction company,23 with a part of Delaunay’s name in capital letters, as if written on a billboard. In his painting Dynamism of a Car,26 Luigi Russolo expressed the idea of speed by representing an automobile passing through the surrounding air, the flow around the front, the compression and breaking of sound waves, as if illustrating the Doppler effect. As a consequence, we have a new model, a truly aerodynamically designed vehicle, shaped by the airflow. The study of air interacting with a car in motion resulted in what looks like a creative interpretation of modern scientific achievements and technological innovations. In that same year, similar experiments led Giacomo Balla a step further; his automobiles virtually disappeared in, so to speak, the abstract vision of the Doppler effect. The use of cubist angular fragmentation in such vivid graphic representations of the aerodynamic forces, or the pressure variation around the object, even the wind noise, one could say, suggesting the increasing speed of the car, lead us to believe that the object itself was of secondary importance; speed was vital in making the car fly. In a poetic synthesis of form and space, it is the burning desire to express speed for the sake of speed, that makes us realize all the limitations of a traditional, Renaissance composition. However, the futurist concept of visual dynamism was substantially different from the one proposed by the orphists. Just as the cubists tried to solve the problem of transposing a three-dimensional object onto the flat picture surface, the futurists found a new means of representing the concept of motion, synchronizing its dynamics with the inherently static medium of painting. The futurists were borrowing the fragmentation of form and divisionism of color, while at the same time evolving their own means of expressing the new pictorial concepts. The principal aim was to capture mobility, and not to represent the object in its totality; “thus a running horse has not four legs, but twenty, and their movements are triangular”,27 the forces of motion and air flow affect the shape of the car, etc. Delaunay, however, did not insist on kinetic sensation but instead used various pictorial elements like prismatic colors, simple geometric shapes, and a more purely plastic form and construction as a means of expressing contrast and movement. His approach was more conceptual, reflecting in a way the belief that the human mind is also dynamic in nature, allowing the viewer to be drawn in or absorbed by the perpetual mobility of colors, objects, and ideas. The view of the relationship between the man and the machine is also significantly different from that of the futurists. The machine is not viewed as a new idol, it is a means, not an end; the idol is the man who creates it—the constructor of modern civilization. Delaunay’s work was inspired by the art of Cubism and the idea of simultaneity, to which he gave a new interpretation. To him the question of orientation or the degree of abstraction were of a lesser importance. Moreover, it was the dualism in his work of a figurative style and an abstract manner that produced the greatest effects. Quite often his exciting experiments resulted in a fantastic conjunction of the realistic observation and pure invention. In this way, he managed to achieve a unique synthesis of color and light, movement and sound in his constructions. His sincerest desire apparently was to embrace the whole world with the wings of an airplane. However, glorifying the beauty of the machine and speed, he was perhaps reluctant to contemplate the consequences of the dynamism of our world, namely to think about the airplane as the perfect vehicle for the delivery of bombs. Dragan Tasić, Homage to Dynamism: A Contribution to the Study of the Iconography of the Machine Cult in Orphism, RIHA Journal 0182, 20 November 2017, URL: http://www.riha-journal.org/articles/2017/0182-tasic, URN: [see metadata]. 1 Virginia Spate, Orphism: The Evolution of Non-Figurative Painting in Paris, 1910–1914, Oxford 1979 (with bibliography). Delaunay executed several paintings, drawings and sketches on the subject, the most famous of which being the monumental version now in the Kunstmuseum Basel and the oil on canvas in the Musée de Grenoble. See also Franz Meyer, "Robert Delaunay, Hommage à Blériot, 1914", in: Jahresbericht der Öffentlichen Kunstsammlung Basel 1962, 67-78; Gustav Vriesen and Max Imdahl, Robert Delaunay: Light and Color, trans. M. Pelikan, New York 1969 (© 1957); Bernard Dorival, Robert Delaunay 1885-1941, Paris and Brussels 1975; Sherry A. Buckberrough, Robert Delaunay: The Discovery of Simultaneity, Ann Arbor, MI 1982; Robert Delaunay, 1906-1914. De l'impressionnisme à l'abstraction, ed. Pascal Rousseau, exh. cat., Paris 1999; Gordon Hughes, “Envisioning Abstraction: The Simultaneity of Robert Delaunay’s First Disk”, in: The Art Bulletin 89, no. 2 (2007), 306 -332; Robert Delaunay: Hommage à Blériot, ed. Roland Wetzel and Sigrid Schade, exh. cat., Bielefeld and Leipzig 2008; Gordon Hughes, Resisting Abstraction: Robert Delaunay and Vision in the Face of Modernism, Chicago and London 2014. 2 Guillaume Apollinaire, The Cubist Painters , translated and commented on by Peter Read, Berkeley and Los Angeles 2004. – John Golding, Cubism: A History and an Analysis 1907–1914, 3. rev. ed., London and New York 1988, became a standard work in the field. Since then the literature on Cubism has grown considerably, with Robert Rosenblum, Cubism and the Twentieth-Century Art, New York 1966, being a particularly vital contribution, etc. 3 The painting shown by Delaunay at the Salon des Indépendants of 1911 has been destroyed. However, it was very close to a version of a slightly later date, which is now in the Guggenheim Museum in New York, see: Golding, Cubism, 157, pl. 76; Visions of Paris: Robert Delaunay's Series, exh. cat., ed. Mark Rosenthal, New York 1997. 4 Blaise Cendrars‘ writing quoted according to Gustav Vriesen and Max Imdahl, Robert Delaunay: Light and Colour, New York 1967, 29; cf. Edward Hirsch, ed., Transforming Vision: Writers on Art, Boston etc. 1994. 5 According to the letter signed by a group of leading architects, artists and writers published in the newspaper Le Temps on 14 February 1887; see Henri Loyrette, Gustave Eiffel, New York 1985, 174. 6 Guillaume Apollinaire, “The Opening”, in: Apollinaire on Art: Essays and Reviews, 1902–1918, ed. Leroy C. Breunig, trans. Susan Suleiman, New York 1972, 262-265; Robert Delaunay, “On the Construction of Reality in Pure Painting”, in: The New Art of Color: The Writings of Robert and Sonia Delaunay, ed. Arthur A. Cohen, trans. David Shapiro and Arthur A. Cohen, New York 1978, 112-114. 7 Translated from Delaunay’s notebook, collection of Mme. Sonia Delaunay, Paris, cited in part in: François Gilles de la Tourette, Robert Delaunay, Paris 1950, 37, and Denys Sutton, “Robert Delaunay”, in: Magazine of Art 41 (October 1948), 208-211, quoted in: Herschel B. Chipp, “Orphism and Color Theory”, in: The Art Bulletin vol. 40, no. 1 (March 1958), 55-63, here p. 61, n. 43. 8 “Robert Delaunay, letter to Wassily Kandinsky, 1912”, in: Theories of Modern Art, ed. Herschel B. Chipp, Berkeley 1968, 318. 9 Robert Delaunay, “On the Construction of Reality in Pure Painting”, in: Charles Harrison and Paul Wood, eds., Art in Theory, 1900–1990: An Anthology of Changing Ideas, Oxford 1999, 152-154. 10 Guillaume Apollinaire, “Modern Painting, 1913”, in: Apollinaire on Art: Essays and Reviews, 1902–1918, ed. Leroy C. Breunig, trans. Susan Suleiman, New York 1972, 101. Reyner Banham, Theory and Design in the First Machine Age, New York 1960; Marjorie Perloff, The Futurist Moment: Avant-Garde, Avant-Guerre, and the Language of Rupture, Chicago and London 1986, xvii, n. 2; David Cottington, Cubism in the Shadow of War: The Avant-Garde and Politics in Paris 1905–1914, New Haven and London 1998; Tom Slevin, Visions of the Human: Art, World War I and the Modernist Subject, London 2015; Andreas Broeckmann, Machine Art in the Twentieth Century, Cambridge, MA, and London 2016. 11 Fernand Léger, “The New Realism Goes On”, in: The Functions of Painting by Fernand Léger, ed. by Edward F. Fry, trans. Alexandra Anderson, New York 1973, 114-118. 12 Werner Haftmann, Painting in the Twentieth Century, 2 vols., trans. Ralph Mannheim, London 1965, vol. 2, 121. 13 Fernand Léger, “The New Realism Goes On”, 115; Christopher Green, Léger and the Avant-Garde, New Haven and London 1976. 14 Guillaume Apollinaire, The Cubist Painters, 75. 15 Such is the title of a British comedy film on the topic directed by Ken Annakin, as well as of a book by Bill Richardson and Allen Andrews, illustrated by Ronald Searle. Both the book and the film were released in 1965. 16 François Thévenot, Aterrissage de Louis Blériot à Douvres, 25 juillet 1909, 1910, oil on canvas, 325 x 470 cm, Musée national des châteaux de Versailles et Trianon. 17 Robert Delaunay. Du cubisme à l’art abstrait, documents inédits publiés par Pierre Francastel et suivis d’un catalogue de l’oeuvre de R. Delaunay par Guy Habasque, Paris 1957. 18 Filippo Tommaso Marinetti (1876-1944), “The Foundation and Manifesto of Futurism”, in: Art in Theory, 1900–1990, eds. Charles Harrison and Paul Wood, Oxford 2003, 145-149; Marianne W. Martin, Futurist Art and Theory 1909–1915, Oxford 1968; Caroline Tisdall and Angelo Bozzolla, Futurism, London and New York 1977; Arnold Pacey, The Culture of Technology, Cambridge, MA 1983, 80-83; Christine Poggi, Inventing Futurism: The Art and Politics of Artificial Optimism, Princeton and Oxford 2008. 19 Filippo Tommaso Marinetti, “The Foundation and Manifesto of Futurism”, 147. 20 Luigi Russolo, The Art of Noise: Futurist Manifesto 1913, trans. Robert Filliou, New York 1967, 4. 21 Marcel Duchamp, “Painting ... at the Service of the Mind”, in: Theories of Modern Art: A Source Book by Artists and Critics, ed. Herschel B. Chipp, Berkeley 1969, 393-394. 22 Catalogue de reproductions de peintures 1860 à 1979 et dix-sept plans d’expositions, ed. UNESCO, Paris 1981. 23 Société Astra des Constructions Aéronautiques, founded in 1908. 24 Irina Gutkin, “The Legacy of the Symbolist Aesthetic Utopia: From Futurism to Socialist Realism”, in: Creating Life: The Aesthetic Utopia of Russian Modernism, eds. Irina Paperno and Joan D. Grossman, Stanford 1994, 167-198. 25 Umberto Boccioni, Pittura scultura futuriste (dinamismo plastico), Milan 1914, 194; quoted in: Ester Coen, Umberto Boccioni, New York 1988, 132. 26 Luigi Russolo, Dynamism of a Car, 1912-1913, oil on canvas, 106 x 140 cm, Musée National d’Art Moderne, Centre Georges Pompidou, Paris. 27 Umberto Boccioni et al., “Futurist Painting: Technical Manifesto”, in: Art in Theory, 1900–1990, eds. Charles Harrison and Paul Wood, Oxford 2003, 149-152, 150. One of the trends in the early days of cubism, Orphism was a style of painting that evolved in Paris during the period between 1911 and 1914. The Orphists rejected the rigid principles of a non-abstract art and returned to “pure color” with the purpose of communicating their intense enjoyment. They were imbued with the new spirit and fascinated by the technological progress of the modern world; Delaunay’s Homage to Blériot was painted in a state of extreme spiritual happiness, reflecting the whole atmosphere of the times. It is a testimony to the skills of the airplane constructors – the new heroes of a modern epic fantasy. World War I, however, spelled the end of the enthusiasm and optimism of the machine age. PDF version The PDF representation of the source document. HTML representation The HTML representation of the source document. MD5 of Source The MD5 sum of the contained office doc.